Passengers on Anthem of the Seas have plenty to choose from when it comes to included dining, with multiple options for light bites, as well as sit-down meals in the evening. Reservations for all restaurants -- fee or free -- can be made ahead of your cruise online. Though reservations aren't required, they're definitely recommended to ensure you get to eat where you want, when you want. If you don't make reservations before you sail, you can always do so onboard at Guest Services or via the ship's free app, Royal IQ. Within the first two days of your cruise, you can make a permanent reservation for each night (i.e. 8 p.m. at Silk at Table 555). For one-off nights check with Guest Services for available dinner reservations. Food and service at the four main restaurants onboard -- Silk, Chic, The Grande Restaurant and American Icon -- are the same and include options for appetizers, soups and salads, main courses and desserts. Appetizers might include a soup of the day, salad and shrimp cocktail. Grilled chicken breast, oven-roasted salmon, strip steak and pasta dishes are featured as entrees. Each restaurant also offers "Signature" dishes -- two appetizers and two entrees -- that are available the entire week and represent greatest hits. Kids' menus are available in all restaurants. Anthem of the Seas features Royal Caribbean's My Time Dining concept, where guests can choose to dine in one of four dining rooms each night. There are designated lines on Decks 3 & 4 for guests with and without reservations. In our experience, guests without reservations never had to wait longer than 5 minutes for a table. Depending on your preference, you can choose the same dining room (and table and servers) each night or switch it up throughout your cruise. Breakfast and lunch are served in The Grande; for set seating you'll need to dine at Chic or The Grande, while My Time Dining is available in Silk and American Icon. Vegetarian dishes and healthy options are indicated on the menus. Waiters also ask about allergies and special requests at the start of every cruise. Information is added to your profile (via tablets), and all waiters will subsequently have that information so they can help passengers select appropriate meals. Our favorite meals of the free variety came at Cafe Two70, where grab-and-go sandwiches and paninis hit the spot. The Grande Restaurant (Deck 3): Passengers who simply love formal night will adore The Grande, where formal dress is required every night. The space is large but feels luxe, with lots of gold and mirrors, and waiters in white gloves make every course feel special. Piano music (though no actual piano) plays as diners enjoy European-inspired food. Chic (Deck 3): Chic is billed as the hip restaurant when compared with the formal atmosphere of The Grande, located just opposite. It has a cosmopolitan, stylish and contemporary feel, with lots of gold, silver and glass decor. There's a wide mixture of seating options, from tables for two to large banquette-style seating. Silk (Deck 4): The decor at Silk is lots of red and gold, with sheer curtains used to divide spaces and give the impression that this is a far smaller space than it is. American Icon Grill (Deck 4): The decor in American Icon has a South Beach vibe, with funky room dividers depicting iconic U.S. sights. Cafe Promenade (Deck 4): Located right beside Sorrento's (a door connects them), this is the place to grab a free freshly brewed coffee, pastry or small sandwich. Do not miss the chocolate chip cookies. Cafe Promenade is open 6 a.m. to 3 a.m.
Sorrento's (Deck 4): Sorrento's, which is in a great spot right on the main promenade (Royal Caribbean calls it the Esplanade), is a perfect place to grab a quick bite if you're feeling peckish. There is no menu, just four different pizzas and plenty of tables. Two types of pizza -- margherita and pepperoni -- are available every day; the other two change daily. You can also have them whip up a custom-ordered pie, including gluten-free pizza. (The pizza is not great, and tastes much better when hot than when it's been sitting under the lights.) Two soda vending machines offer a bewildering number of soda types, and you can order beers from behind the bar. You'll need to pay extra for both drink types. Sorrento's is open 11:30 a.m. to 3 a.m. The Cafe @ Two70 (Deck 5): The Cafe @ Two70 serves casual bites all day -- including a variety of vegetarian and gluten-free options. It's designed to look like a bistro, and the food reflects that. Counters serve ready-made (but warmed on the spot) sandwiches, desserts, and made-to-order fare, such as salads. There's no seating in the cafe itself. Instead, passengers order food in the cafe and carry it out to Two70 -- which has tall tables, standard tables and booth seating -- or outside the venue, where you'll find a couple of farm tables and cozy seating nooks. Open for Continental breakfast, served from 7:30 a.m. to 10:30 a.m., this was our favorite spot to grab a bite before starting the day. Items include bagels (made on the ship), pastries, oatmeal and parfaits -- a number of which catered to special dietary needs. The cafe reopens for lunch/dinner at 11:30 a.m. and closes each night at 7:30 p.m. Lunch and dinner options are salads, soups and sandwiches. It's a refreshing change from more formal or buffet options, and while components are premade, food is served hot (if it's a hot item). There's also an extensive beverage bar in the cafe that includes tea, coffee, flavored water (like strawberry kiwi and mango) and juice. 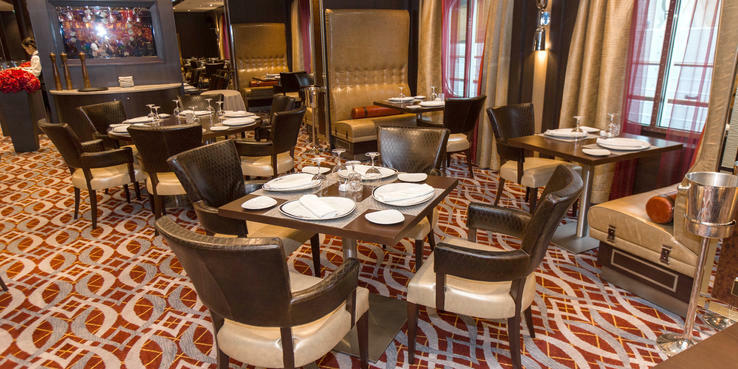 Solarium Bistro (Deck 14) : After getting its start as Devinly Decadence, this dining venue was rebranded in December 2015 after celebrity chef Devin Alexander and Royal Caribbean parted ways. Breakfast and lunch options include light fare, such as yogurt and fruit in the morning and a variety of mixed salads at lunch. Windjammer Marketplace (Deck 14): Windjammer Marketplace is Royal Caribbean's buffet, and on Anthem of the Seas, it's extensive. The space is broken up into stations, such as "Bread" and "Mediterranean Specialties." Seating options include many tables for two or four, as well as larger tables that encourage socializing. A small hand-washing area greets passengers at the entrance, and a crew member reminds diners to use it. Breakfast (6:30 a.m. to 11 a.m.) includes virtually everything you can imagine, from pastries and yogurt to eggs. A made-to-order station allows passengers to order items like omelets and crepes. Lunch (11:30 a.m. to 3:30 p.m.) is a solid combination of sandwiches and burgers, as well as items like pork loin or broiled fish. Dinner (6 p.m. to 9 p.m.) has a broader array of hot entrees and often includes specialties like a prime rib carving station. While we loved the variety of hot and fresh breads at the bread station, we were disappointed by the small selection at the salad bar. Coastal Kitchen (Deck 14): Coastal Kitchen is a Mediterranean "fusion" restaurant; the menu items are a blend of both classic Mediterranean food and cool California-style cuisine. This restaurant is open only to suite passengers. Those booked in Grand Suites and above can dine there for breakfast (7:30 a.m. to 9:30 a.m.) and lunch (noon to 1:30 p.m.), while passengers in Junior Suites and higher can enjoy dinner there (5:30 p.m. to 9:30 p.m.). The room is light and airy, though there's a rather unusual set of high tables connected to those at normal height. You end up looking down on your fellow diners, which makes for slightly uncomfortable conversation. For breakfast, passengers can choose from made-to-order omelets, frittatas, eggs Benedict and smoked salmon, as well as a Mediterranean Plate that includes hummus, prosciutto and cheese. Pancakes, French toast and a variety of cereals also are available. Lunch includes a selection of sandwiches (smoked mozzarella or grilled chicken, for example) and salads (such as antipasti or wedge). At dinner, don't miss the flatbread options -- something of a blend between pizza and pita, where personal-sized thin-crusted breads are topped with sauces (barbecue or marinara, for example), veggies and/or cheese. Try the standard margherita or salmon variations. SeaPlex Dog House (Deck 15): SeaPlex Dog House is basically a food truck at sea, located in the SeaPlex complex on Anthem. The selection is fairly limited, in that only hot dogs are served there. Still, they're good hot dogs, and passengers who don't eat red meat will be happy to see chicken options. The SeaPlex Dog House is open daily from 11:30 a.m. to 7 p.m.
Room Service: Room service is available 24 hours a day but only continental breakfast is free; all other orders carry a $7.95 surcharge per order. Items delivered from Michael's Genuine Pub (pork sliders or hot breakfast items, for example) also include a charge in the $4- to $5-per-item range. Tipping for room service is not required, but delivery people always appreciate it when you fork over a buck or two for the service. If you're looking for more attentive service, intimate surroundings or just want to try something completely different, you'll find a good variety in the for-fee restaurants, including Italian, Japanese, steaks and molecular gastronomy. Overall, the quality of food at the upcharge restaurants is better than you'll get at the included restaurants, but a for-fee sit-down venue on Anthem is as much about the overall ambiance and quality of service as it is about the cuisine. The for-fee restaurants have been well considered, and all are pitched at a reasonable price point. If you expect to dine at a number of the sit-down alternative restaurants, you can save some money by booking online ahead of your cruise. If you book three restaurants, you get a 20 percent discount, four gets you a 25 percent break, and five reservations will save you 30 percent. Reservations are recommended for all sit-down fee dining. Children 5 and younger dine for free at these restaurants, while those ages 6 to 12 order off a special menu at each restaurant at a cost of $8 per child. Children 13 and older will be charged the full adult price. Michael's Genuine Pub (Deck 4); a la carte pricing: Michael's is a true pub, complete with dark wood, great beer and some serious snacks. Created in partnership with famed Miami chef Michael Schwartz, the pub has TVs for sports viewing and a diverse selection of craft beers like Brooklyn Lager, Dogfish Head 90 Minute IPA, Bear Republic Raver 5 India Pale Ale and of course, Michael's Genuine Home Brew. Beer aficionados can order any beer with a branded souvenir glass for an additional $7. It also offers a number of unusual cocktails for non-beer-drinkers. Starters are a highlight of the menu at Michael's. They're mostly finger foods, but they aren't your typical bar bites. Try the deviled eggs and polenta fries (even if you don't like polenta); the small bites range from $3 to $5. A "pub board" of meats, cheeses and pickled vegetables runs $15, and pub meals like fish 'n' chips and bangers 'n' mash are $12.50. Desserts are $5; we recommend the peanut butter cup. Michael's is open daily from 11:30 a.m. to 1 a.m.
La Patisserie (Deck 4); a la carte pricing: Set on the main promenade in a bright, open space, this cafe serves genuine Starbucks coffee -- but at a price. A tall latte will set you back $4.50. It also serves divine hot chocolates from $4.50 and a lovely selection of pastries (from $1.95), cupcakes ($2.95), truffles ($1.25), macarons (called "stackarons," $1.25 each) and chocolate bars ($3.75). It's open 7 a.m. to 10 p.m.
Jamie's Italian by Jamie Oliver (Deck 5); $20 for lunch, $30 for dinner: Celebrity Chef Jamie Oliver is known for promoting family-style Italian dining. He brings that onboard Anthem of the Seas, where the menu at his restaurant includes items like "planks": boards filled with cured meats, cheeses, olives and capers or vegetables, designed to be shared as a starter. Oliver says his food onboard is held to the same quality standards as that in his land restaurants (sustainable produce and high animal welfare, for example). The decor, designed by Oliver's team, is rustic Italian with pops of color and a modern twist. Dried peppers and sausages hang from the walls, and cans of tomatoes are strewn throughout. They're also used to prop up the planks when they're brought tableside. Menu highlights include the planks, burger, lasagna and the slow-cooked pork belly. Jamie's Italian is open for lunch (with a similar but more limited menu) from noon to 1:30 p.m. and for dinner from 6 p.m. to 9:30 p.m.
Wonderland Imaginative Cuisine (Deck 5); $45: Wonderland is Anthem's most innovative restaurant, using a molecular gastronomy style of cooking -- dry ice, unexpected flavors and aromas, tiny portions, dishes that aren't what they appear to be -- in a setting that's meant to be reminiscent of Alice's Adventures in Wonderland. From the decor and the seating to the waiters (who aren't really waiters, more "guides") and the menu itself, Wonderland is designed to be fun, imaginative and quirky. The physical menu starts off blank (we won't give away how it's revealed) and is divided by six elements: sun, sea, ice, earth, fire and dreams. You can opt to pick for yourself, or let your waiters do it for you. It's also, incidentally, the only venue on the ship where you'll find candles with real flames. The food isn't to everyone's taste, so prepare to be challenged: Chicken liver balls were tasty but slightly oily; Japanese breadcrumbs, designed to represent soil, were dry; and the spicy Korean battered kimchi was a bit like cardboard. Some of the playful starters included a wood-smoked egg (complete with wood smoke emanating from a glass lid) and a "liquid" olive. Some of our party described this as "nonsense food"; others were entranced. For us, the tiny portions dragged on (it's a long meal), but they were redeemed by a quartet of some of the tastiest large dishes we have had on a ship: 12-hour braised beef on the bone, succulent chicken, slow-cooked halibut in the bag and pan-fried sea bass. Desserts were similarly out of this world: Arctic Equator Chocolate (a riff on the traditional baked Alaska) and The English Box (an unusual version of traditional sticky toffee pudding) were outstanding. Wonderland is open for dinner from 6 p.m. to 9:30 p.m.
Izumi Japanese Cuisine (Deck 5); a la carte pricing: Decor at Izumi is similar to what you might find at any high-end sushi restaurant on land -- sleek and modern, with Asian art and a huge open sushi bar in the middle. Located on Deck 5, it overlooks the Esplanade and is separated from foot traffic only by a series of red glass screens. Cuisine, of course, leans heavily toward sushi and sashimi, which tastes fresh. Specialty rolls include an innovative truffle creamy lobster tempura roll with asparagus, salmon and tempura lobster, as well as the Izumi Ryu Futomaki roll with assorted sashimi, cream cheese and wakame salad. The menu is fairly limited for those who don't eat seafood or sushi, with only a couple of noodle dishes (udon or ramen, for example) and salads. Pricing is less than you'd pay on land for sushi. Lunch is served noon to 1:30 p.m., while dinner is 6 p.m. to 9 p.m. Chops Grille (Deck 5); $35: Chops Grille is Royal Caribbean's steak restaurant. It's a staple -- and a favorite -- on many of the cruise line's ships. On Anthem of the Seas, it's located just off of the Schooner Bar. It's decked out as you might expect: low lighting and chunky, dark wood furniture. Don't even think about going there if you're a vegetarian; the emphasis is on meat, meat and more meat. However, there is a number of delicious fish dishes, such as grilled branzino (sea bass), snapper Veracruz, crusted tuna and spicy jumbo shrimp. Cuts available are filet mignon, N.Y. strip and slow-braised short rib of beef. There are also some excellent sides, such as mushrooms, grilled asparagus, creamed or steamed spinach and truffle-coated fries (you can ask for no truffle), served family-style. For those who really want to splurge, Anthem offers dry-aged steaks at sea (for an additional $18 or $19, depending on the cut) and Maine lobster ($21). Service is highly attentive and accommodating, and it's great value for the money. Chops is open only for dinner from 6 p.m. to 9:30 p.m.
Prime Table @ Chops Grille (in Chops Grille, Deck 5); $95: Save your appetite for this experience. It's offered every night on Anthem of the Seas and gives passengers a chance to try a five-course meal, complete with specially selected wine pairings. It's held in a private area of Chops Grille. Food options are reflective of a high-end steakhouse, so items like lamb cutlets and premium cuts of beef might be served. The dinner accommodates 12 to 16 people; if it doesn't hit the minimum, it could be canceled. Johnny Rockets (Deck 14); a la carte pricing: Johnny Rockets is a mainstay on the Royal Caribbean fleet. It's back on Anthem, right beside the pool area, so you can just turn up in any attire and order a burger, fries, sodas and shakes. The key difference is that, rather than a flat $4.95 fee (only charging extra for shakes or malts), you get charged by the item ($2.50 for a burger, $4.50 for a shake, $1.50 for a soda and $1.50 for fries). You place your order at the counter and are notified via a ticketing system when your food is ready for pickup. There's limited seating in the restaurant (and only two of the famous red booths), but it feels more like a carryout joint. The food is acceptable -- nothing special -- and its proximity to the free Windjammer does make you question why you'd spend money there at all. Johnny Rockets is open daily from 11:30 a.m. to 7 p.m.